The Info pane in Motive displays real-time tracking information of a rigid body selected in Motive. This pane can be accessed under the View tab in Motive or by clicking icon on the main toolbar. This pane lists out real-time tracking information for a selected rigid body in Motive. 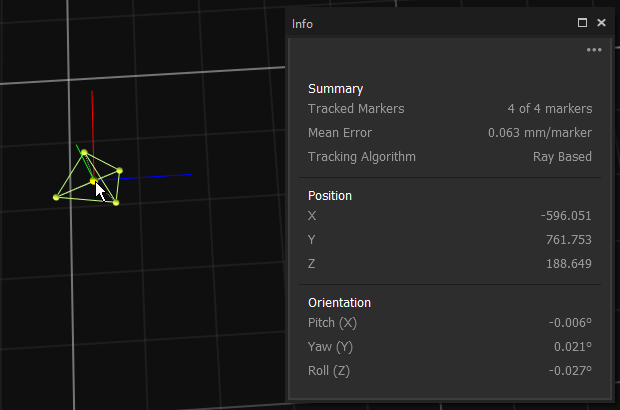 Reported data includes a total number of tracked rigid body markers, mean errors for each of them, and the 6 Degree of Freedom (position and orientation) tracking data for the rigid body. This page was last modified on 26 July 2018, at 07:14.